Hair Accessories for Grown Women: What’s Appropriate for Work, Play, and Beyond? Because everything old is new again, scrunchies, headbands, and claws are back in style and being offered as hair accessories for grown women, and I can’t wait to hear readers’ thoughts on them. I know some people have always been Team Scrunchie; I myself have always been Team Claw (and of course, the old black Ouchless elastic I wear on my wrist pretty much every waking hour). But there are strong opinions about this! Are you going to give headbands a whirl in 2018? Are some of the more decorative options (like the goldish star claw) just not appropriate for most women over a certain age (like 16)? For those of you who have strong opinions FOR hair accessories, which stores make the best hair accessories in terms of comfort, durability, price, look, etc? Psst: our last poll on what kind of hair accessories are appropriate for the office … in 2009! For my $.02, I probably will give headbands a whirl again — but only with ones I already own. I’ll probably skip the scrunchies just because I don’t think my round face shape looks particularly great with a low ponytail, and I feel like that’s where scrunchies excel. I’ve always like claws for comfort and an easy half-up-do or (with a huge claw) a French twist — but those tend to be bad hair days for me so I probably don’t want to try more attention to my hair with something really decorative. Looking for more sedate options for hair accessories for grown women? Ann Taylor, J.Crew, and Nordstrom (particularly from these two drool-worthy brands) have a ton of similar styles. 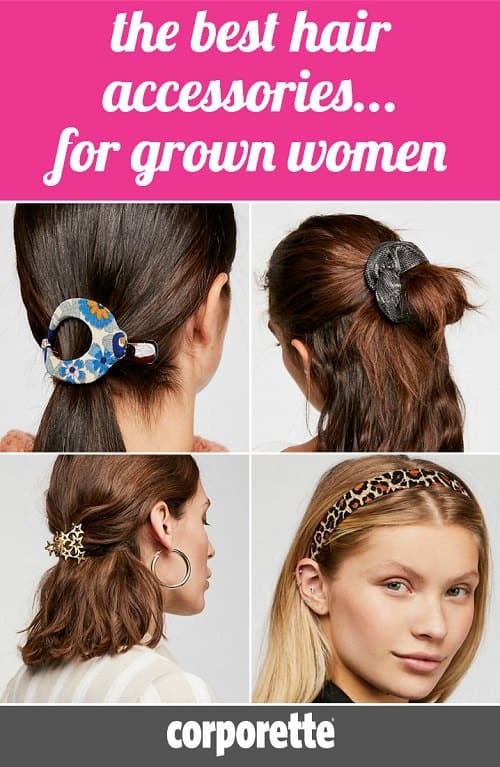 Ladies, let’s hear from you — what are your thoughts on hair accessories for grown women? What looks do you wear the most for work and play — what products are you excited about to be back in style? Headbands never really looked good on me, so I will likely avoid that. I did just buy a 6 pack of scrunchis at Target in a bunch of colors. I like putting my hair in a ponytail with a black hair tie, then putting a scrunchi over it. It’s cute, sometimes it goes with my outfit, and it helps keep my ponytail from getting loose (usually a mid-to-high pony). Scrunchies are frumpy unless you are super on-trend otherwise, which is not most people. A tortoise-shell claw clip is classic and always acceptable at work. I think a very plain (preferably black or tortoise-shell), skinny headband is okay at work but is not going to win you any style awards. The manageing partner loves my schrunchies! He even had Margie start wearing them, but they do NOT look as good on her b/c she has curly brown hair and my hair is straight blond, makeing the contrast that much cuter. Even Dad, who normally has few good things to say about my hair, loves me in schrunchies. As to wearing extensions, NYET! My hair is one asset that can’t be improved upon, Dad says. If only men would realize this, I would be married by now. FOOEY! Agree 100% about all three. The worst scrunchie look is wearing your hair pulled straight back from your face into a high bun with the scrunchie around it; this looks like you’re someone’s maid. That midwestern mom look is coming back though–fanny packs, high-waisted jeans. I love a half up half down look, but you are right that I haven’t been doing it for a few years. I’d be willing to start that one again though. I’m waiting on the return of the banana clip. I could rock a banana clip. I don’t think I can take any grown woman wearing a scrunchie seriously. They are so tied to my childhood that I can’t dissociate them from child-like characteristics. To quote SJP, talking about a detail in Berger’s book: A SCRUNCHIE?! WHO WEARS A SCRUNCHIE? Yeah, I make all my hair & fashion choices based on what someone said in a TV show 20 years ago. Always have worn simple, dark-colored (brown, black, navy) headbands and barrettes (not clips) – nothing that pokes out, but rather stays flush to my head and keeps hair neat on unmanageable hair days. Like most things, i think it depends how you wear it. I think hair accessories should not call attention to themselves, but should keep it neat. Just my opinion. And I will be rocking one while I watch the royal wedding TOMORROW! @SeniorAttorney, that is the best thing I have seen all week! Any suggestions for headbands for a larger-than-average head? My 14 and 11 year old daughters are very into scruchies. In fact they were arguing over who owned which ones just last night. If they are popular with my teens, I’m probably not going to wear it!! I do ponies for work and have worn barrettes and every blue moon an elastic with a ribbon bow. Low ponies, sleek, and the hair toys are either black or blend with my hair. Headbands are pretty much the only thing I can successfully do to accessorize my hair. I don’t wear them everyday or anything, but I do think it can go a long way to add something to an outfit without looking too young. Small claw clips are my go-to for keeping a bun in place. Never had an issue with them being seen as unprofessional. Scrunchies, yeah… not a fan. I do think they lend themselves to feeling a little young. Because they are, well… scruched up fabric, to me it feels a bit reminiscent of ruffles on a frilly little girls’ dress. That’s just me. Threddies https://threddies.com/ has a great selection of basics for every occasion. Folks may want to click the links for the hair accessories that aren’t displayed. Those clips, barrettes, and dainty headbands are exactly what I’ve been looking for and couldn’t find. They are elegant, classic, and different enough to persuade me not to do something radical with my hair in order to shake things up. I don’t believe I would have ever found the links if you hadn’t made the post. Thanks! If Nyone has any more leads on these types of hair accessories let me know. I like Parcelona items off amazon. They last forever and will often help you identify the type of hair that style will work best with. The lillarose site is incredible, and beautiful, for flexible hair clips, headbands, bobby pins. There are tons of style ideas and styling videos too! I wore headbands a lot in my 20s. But now approaching 50 I really don’t think I could pull it off. My preferred hair styles are those that do not require accessories, but for social occasions I don’t object to rocking a big decorative barrette. Ficcare Maximas. Many lovely colors, chic and elegant. No to scrunchies, no to headbands. I have a hair toy collection. Forks from Etsy hair sticks of bone and wood bejeweled or not. Claw clips of all sizes. Barretts to match suits. Hair bands not so much they slip or hurt my ears. I’ve run the gamut of elastics spin pins Amish hair pins. Ficcarre clips have come and gone learning curve using them. A nice French braid or Gibson tuck with some tasteful bling are my favorites. Favorite Etsy: grahtoe or timber stone turnings. Unbranded natural wood barrettes in particular Koa wood from HI. I think any hair accessory that looks nice, holds your hair well, and You like, is appropriate. Obviously older women don’t want plastic or childish toy shapes, but different things look good on different people. Why should anyone have to follow anyone else!s personal taste or opinions. If you like it, wear it and if others are rude enough to make fun, then they aren’t important or valid.